Hi Trekkies, Did you find any of these awesome Star Trek books under your christmas tree? In case you were disappointed, I've decided to add some sparkle to your Star Trek Universe with these all time favorites of mine. 23 new from $18.69, 19 used from $8.99, 2 collectible from $29.99. I can't imagine being a die-hard Trekker without this book: the ultimate reference to people, places, things, events in the entire Star Trek universe from the original series of 1966 through all the movies and series right up to Voyager. I think I know a lot about Star Trek, but oh my lord! This is THE reference book for fans. It literally has EVERYTHING. Covers planets and stars, aliens, starships, characters, baseball cards, scientific terms, inside gags, YOU NAME IT! It is astounding how much work and effort must have gone into this book. The book itself is beautiful. It is illustrated with color pictures from the show and technical illustrations done by the authors. The pages are glossy and laid out beautifully. It also serves as an episode guide, covering up through the release of "Star Trek: Insurrection". What a wonderful labor of love this book is. It is very entertaining and informative, and a must have for any fan of the series. A must-read for every Star Trek fan. Franz Joseph's STAR FLEET TECHNICAL MANUAL includes many design elements that might raise questions in the minds of Star Trek fans. Is the Enterprise's bridge really rotated 36 degrees off the ship's centerline? Does the Federation really have a starship with three warp nacelles? Is Starfleet's shuttle craft really too small to allow its occupants to stand up and walk around? 30 new from $9.33, 18 used from $5.72. 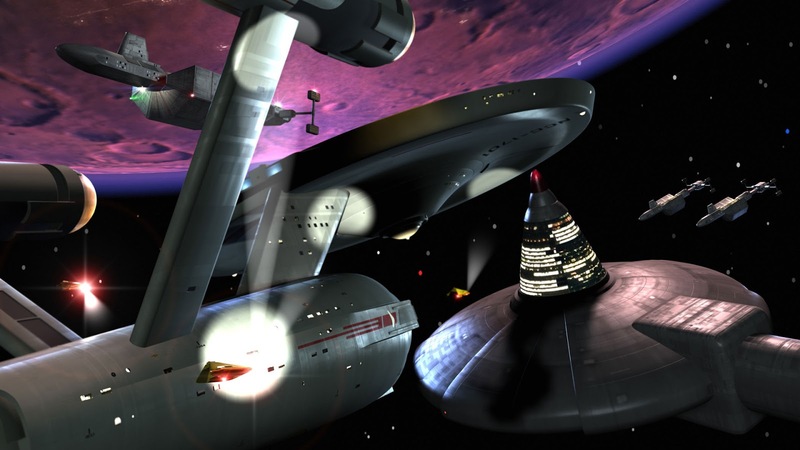 The vessels portrayed in Ships of the Line cover the length and breadth of the Star Trek universe. Arranged chronologically, from the earliest warp vessels to the futuristic Enterprise-J and darn near everything in between, this is a book you'll never tire of looking at. Images of the U.S.S. Enterprise dominate this collection but there are also wonderful representations of plenty of other Starfleet ships, as well as vessels associated with both friends and foes. The variety of images is fantastic. Battle shots, alien landscapes, illustrations depicting the wonders of the universe and images that commemorate some of Star Trek's most memorable moments can all be found within the pages of Ships of the Line. 20 new from $15.30, 157 used from $0.01, 10 collectible from $10.00. If you're a TNG Trekker then you'll just soak up all the information about life aboard the USS Enterprise NCC 1701-D. This book covers Warp Drive, Turbolifts, Bio-beds in the Sickbay, Tricorders, Hull Material and construction, Holodecks, impulse drive engines, phasers, facts about the Utopia Planitia shipyards, and even the system of addressing crew quarters and such. There is so much information here it's great. 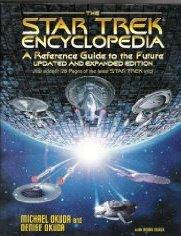 The book also has footnotes throughout about different happenings on the set of StarTrek:TNG. It is well organised with diagrams and plans for many of the parts of the Enterprise. This really shows the planning which is put behind the world of Star Trek, and how they do their best to make sure the stories fit technical plausibility with cohesive adventures. 12 new from $9.33, 12 used from $8.81. I used to have a very simple definition of a textbook: a book that contains a great deal of factual information, but puts you to sleep while attempting to absorb it. This totally fails to meet the second criteria (unlike, for instance, the TNG Technical Manual).XD! !but it as to be said there are fantastical technical details in the TNG Manual. Essentially, this is a collection of Trek trivia, in terms of equipment, creatures, and medical techniques, from the shows. 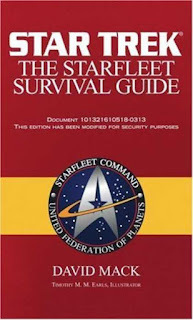 However, from the style it is written in one can clearly picture a Starfleet officer actually reading and using this Guide. The descriptions are very clear, concise and interesting. One of them - Section 1.11, "Surviving Atmospheric Re-entry in a Pressure Suit" - is downright compelling reading. The mental picture of each step is incredibly vivid and so involving, that one can actually feel worried when reading the fatal consequences of anything going wrong. This is a brilliant piece of writing and extremely entertaining. For someone starting to collect Trek trivia books and/or manuals, this is definitely the one to recommend buying first. 16 new from $10.97, 17 used from $4.99, 1 collectible from $20.00. "A warrior fights to the death." That quote alone speaks volumes about "The Klingon Way." 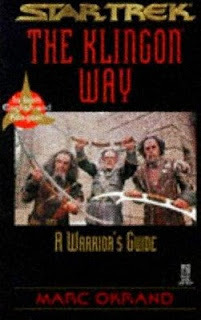 Star Trek Klingon for the Galactic Traveler is an excellent addition to your Star Trek library. Not long after reading through this book, I almost felt as if this were a real culture I was reading about. 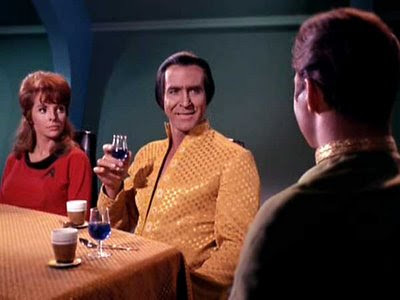 Some of the Star Trek "extras," as I like to call them are at best, expendable. That is not the case in this book. If you're even remotely interested in or intrigued by the Klingons, this book is worth the price. My only complaint as with other Star Trek "extras," is that it's peppered with black & white photos. Thank you very much to the author for this one. 4 new from $49.98, 28 used from $3.00, 2 collectible from $24.00. This is the ultimate Klingon book! It brilliantly weaves the tapestry of Star Trek's Klingon history through to its publication date in May of 1996. It is written both in English & Klingon. The photos are black & white. *GROAN* Each page contains a quote in both languages with a detailed explanation of the Klingon terminology. If you have not picked this up for your Star Trek collection, let me quote a Klingon phrase for you, "qoH vuvbe' SuS" ("The wind does not respect a fool"). If you can still find a copy of this, enjoy it! 9 new from $9.92, 20 used from $0.97, 1 collectible from $75.00. 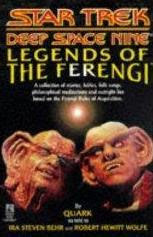 "Legends of the Ferengi" is a hilarious spoof on fairy tales and folklore anthologies. This book is a fascinating read for folklorists with dozens of in-jokes that had me literally doubled over with laughter. In the DS9 episode "Rules of Acquisition," the Ferengi Pel claims to know all 285 Rules of Acquisition plus the commentaries. This book gives you some of those commentaries --- at least, for the 70 Rules that were actually revealed on the series. The authors, Ira Behr and Robert Wolfe, wrote most of the DS9 Ferengi episodes. Now they give you the story behind each of the Rules, including #113, the "Rule that dare not speak its name." You will also learn the first two words that any Ferengi learns in the Hew-Mon language ("No refunds"), The ten most famous insults in Ferengi history (see p.32) and the story of the infamous villain Drek, M.H.N.L.I.I. (May His Name Live In Infamy), who actually cut his prices and gave his customers BARGAINS, thereby causing the Ferengi economy to crash. Which is one reason why every Ferengi child is duly warned about the dangers of Real Life through supernatural horror stories about that bogeyman of bogeymen -- the Smiling Partner! And so on. I thoroughly enjoyed this book, which has lots of great B&W stills from the series, too. Drek was right --- some things really ARE bargains! 4 new from $15.00, 26 used from $0.01. 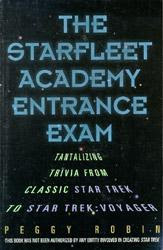 More than just a trivia book, The Starfleet Academy Entrance Exam is a series of tests of your knowledge of classic Star Trek, Star Trek: The Next Generation, Star Trek: Deep Space Nine, and Star Trek: Voyager. Basically just another trivia quiz book, this one adds one thing to the mix: a collection of Top Ten lists and similar examples of Star Trek "humor." 15 new from $2.50, 114 used from $0.01, 8 collectible from $12.50. 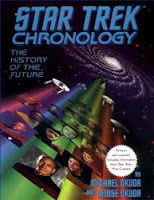 The authors of this book certainly had a daunting task, namely to put all of the events in Star Trek: The Original Series, the first six Star Trek feature films and the first five years of Star Trek: The Next Generation in chronological order. TNG has seven seasons, so stay clued. Some of the events are mentioned only on passing in episodes, yet they have managed to tie all of it together into a surprisingly coherent whole. There are of course places where a consistent chronology is just not possible, and those situations are identified as such. Nevertheless, if you are a fan of Star Trek and are interested in what happened when, then I recommend this book to any true Star Trek fans! Merry Christmas to all my readers and friends. In years past I've really enjoyed writing about Star Trek, aliens and advanced lifeforms, Spock's Vulcan logic, crazed disturbed characters, Star Wars, starships, warp technology, klingons fighting weakling humans and hot Trekkie chicks. Heres to an awesome Christmas and Prosperous New year..
Live Long and Prosper, Trekkies and Star Warsians. Star Trek Spoof: The Search For Women. Star Tech: The Search for Women (Uncensored) from justin on Vimeo. Heres some trek fun for you to enjoy. But then Director J.J. admits freely he isn't a Star Trek fan by default, (which was a surprise to me) in fact he has confessed his Star Wars dark side sins to Comic Con fans ages ago. This was a clever move because it removed much speculation about who would be directing Star Trek 2009. Mr Abrams has set the record straight without messing too much with the Final Frontier.....I suspect Paramount will get him again to make the next Star Trek movie. Perhaps its the dark side of the force making J.J. describe Star Trek's detailed canonicity as archaic!!! meaning ancient, primitive or earlier. So I've done a little digging and found some of these "archaic details" for you to have a listen to. Is Star Trek cannon really so confusing with detailed technobabble, alien docking procedures, isophasic signatures and quantum singularities that its too hard to follow? Project yourself into a far-flung corner of the universe where your very life hangs in the balance, all because you stepped through a time portal. A new doorway opens and spits you out into the dimensional plane of another galaxy. Is it possible to move in the 1st 2nd and 3rd dimension (up, down, forwards, backwards and sideways) and if so why does time hold us prisoners in the 4th dimension? The portal vanishes in mid air abandoning you on a strange new world in the distant future. Time travel can cause a tremendous shock to the system especially for someone having experienced it for the first time. But the body and mind has a way of coping even with the most traumatic of circumstances. An army of humpback Morlocks emerge from the underground caverns yelling at you You've been spotted. They advance towards your co-ordinates using a steady delta pattern formation. Its funny how fear has a strange effect on ones feet and can make them run instinctively before logic kicks in. Frak, your communicator stops working and tricorder scans are detecting unusual energy readings nearby. Trained astronauts are prepared for away missions on alien planets but frak it, time travelling is only supposed to happen in Science Fiction. Heres another fine mess you've gotten yourself into. Earth is unreachable and humans are nowhere to be seen which is creepy. Tricorder readings indicate this is an M-class planet with a nitrogen-oxygen atmosphere with two suns, a neutron star and a neighboring wormhole in the vicinity.... nothing is normal about this place. It would be so gratifying to let loose with an emotional outburst right about now, There simply has to be some way to return to Earth in the 21st century using time-travelling means. The morlocks have lost interest in you now. What are they up to? and who are these Eloi humans? H. G. Wells's 1895 novel The Time Machine set people's imaginations on fire about time travel. Then, in 1905, Einstein's Theory of Special Relativity seemed set to add substance about time travel in our universe, nearly making it so. The logic of it is fantastic. His theory says that time isn't constant but slows down the faster you go - and the theory has since been proved. In effect, one has to be going very fast indeed. Some scientists have estimated that, if humans could travel at the speed of light, we could go backwards in time but Einstein determined otherwise. Travel at the speed of light is impossible. Other time-travel theories involve wormholes in spacetime, black holes and other mysterious bits of physics like dark matter. But you probably won't be shocked to read that no one has actually succeeded in building a time machine ... at least not yet. There's a big ethical dilemma associated with building a time machine and the potential dire consequences of it falling into the wrong hands. If you travel backwards in time, you can alter the future. And if you travel into the future and then come back to the present, that too can alter the fabric of the current timeline.. In Star Trek we call these Temporal Incursions and Captain James T. Kirk is in the history books for breaking the Prime Directive. 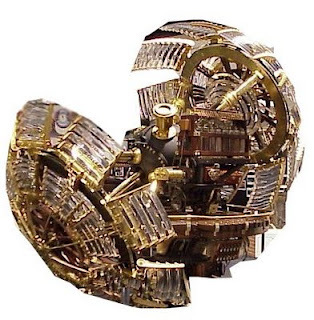 But if you can get your head round this basic paradox, come up with some extremely sophisticated technology, and understand an awful lot of mystifying, strange physics, perhaps you can become the inventor of the first time machine. Live Long and Prosper, Star Trekkers! Which famous Star Trek characters do you like the best? This week I found a cool selection of verbal stimuli relating to Star Trek's timeline. Go on satisfy your trekkiness and add some of your own favourite Star Trek, SF quotes. Which Star Trek character delivered these cosmic quotes of awesomeness? In my mind they'll never age. "Two to beam up Scotty." "I'm a doctor not a mechanic." "Get us out of here, maximum warp!" "I can't give you warp 9 for much longer." "I am Locutus of Borg. Resistance is futile. Your life as it has been is over. From this time forward, you will service us." "You really are just like me." "Did we just see the beginning of a new lifeform?" "You are the finest crew in the fleet and I would trust my life with each one of you." "We'll continue to follow our directive, to seek out new worlds and explore space." "Lets make sure, history, never forgets the name, ENTERPRISE." More later on trekkers, now take us out, ahead warp factor 9. Remember Star Trek's TOS episode "The Trouble with Tribbles?" Captain Kirk soon discovers what Scotty and Chekov were brawling about on the K-7 Deep Space station. Here's Scotty's and Kirk's funny dialogue word for word. Owner/Creater: Paramount Pictures and/or CBS Studios. Capt. Kirk: Is that all? Capt. Kirk: I get the picture, Scotty. Capt. Kirk: And after they said all this, that's when you hit the Klingons. Capt. Kirk: What was it they said that started the fight? Scotty: They called the Enterprise a garbage scow. Sir. Capt. Kirk: I see. And *that's* when you hit the Klingon? Scotty: Well, sir, this was a matter of pride! Capt. 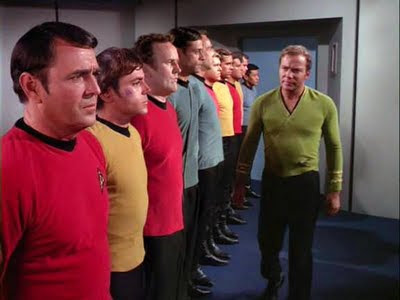 Kirk: All right, Scotty dismissed. Oh, Scotty, you're restricted to quarters until further notice. Scotty: Yes, sir. Thank you, sir. That'll give me a chance to catch up on my technical journals. The U.S.S. Enterprise(NCC-1701), like her twelve sister ships* in Starfleet Command is primarily a scientific and research vessel of deep space exploration of the 23rd century. What is the USS Enterprise 1701's primary mission objective? Why seeking out new life forms on new civilisations, boldly contacting aliens who have discovered the basics governing warp technology key to achieving interstellar warp travel and what will the United Federation of Planets do? They'll send out Kirk's flagship to wellcome the fledglings into the club. In over forty years of meeting new lifeforms, the USS Enterprise NCC-1701 has upgraded with at least two refits during her much watched five year missions(2265-2270). 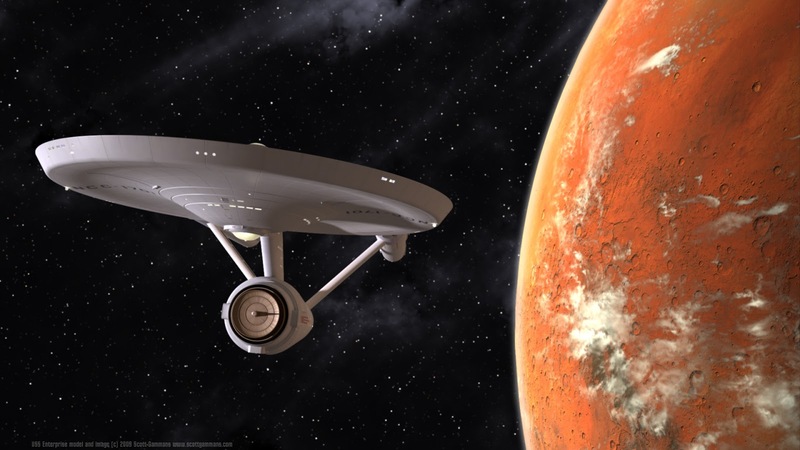 Kirk's ship has engaged in scores of first contacts, military conflicts and time-travel. She has defended earth from the Klingons, Romulans, a Planet Killer, and the Alien Space Probe. Under command of Captain James Tiberius Kirk, the Enterprise NCC-1701 was destroyed in 2285 in a bid to outwit Commander Kruge and his klingon bird of prey. Science Officer Spock is always on the lookout for subspace anomolies, spatial disturbances, hostile energy lifeform readings and with sensors scanning at maximum to locate accurate planetary positions, Spock's analysis is strategic to pinpointing starship dangers in a matter of seconds on the ship's approach to a new star system. The USS Enterprise's Science Station provides Captain Kirk with enough military intelligence to blast potential enemy starships to smithereens but lets not forget Chief Engineer Scotty. When the USS Enterprise 1701 took a mighty, helluva walloping from Romulan enemy fire, Scottys first on the Captain's case about the structural integrity of the ship and his precious warp engines. "The ship is packing quite a walloping, she can't take much more of this. She'll blow up in four hours." In the eyes of Commander Kruge's Lieutenant Commander, the USS Enterprise 1701 was a formidable "battlecruiser" capable of defeating her enemies but its really Scotty's engineering "Miracle Worker" touch keeping her together. 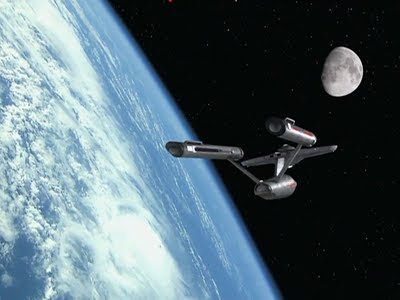 In Star Trek's universe, Kirk's constitution-class starship doubles as the flagship of the United Federation of Planets peace-keeping force and as a military heavy cruiser. While under way, every Federation starship is completely manned at all times. Aboard the USS Enterprise it's no different. Each watch consists of eight hours of normal duty. When yellow alert sounds, a second watch is activated and during red alert, all watches are called to battle stations even if your'e snoozing soundly in your bunkbed. 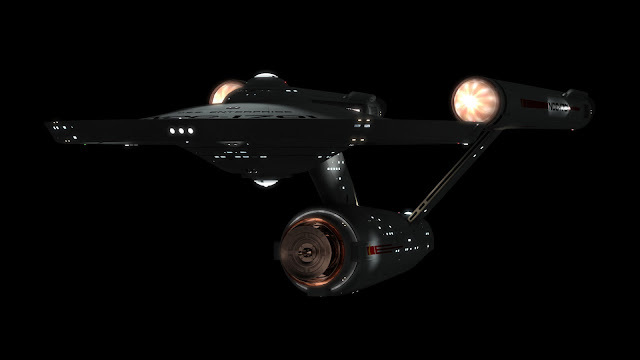 Each of the USS Enterprise NCC 1701's 23 decks is equipped to handle its own gravity. When the ship jumps to warp, Anti-acceleration/deceleration inertial dampeners prevent the crew from leaving strawberry stains on the walls from rapid acceleration. The Enterprise is equipped with shuttlecraft for ship to planet away missions. In crises situations with the ship is under attack or when Captain Kirk is cheating the jaws of death (Doomsday Machine) Trekkies can always rely on the transporter pad malfunctioning. Just when its needed most! Fortunately for Chief Engineer Scotty, the U.S.S. Enterprise NCC - 1701 has two well known shuttlecraft. During special missions, the "Galileo" and "Columbus" are called into service to transport crew members/ambassadors/v.i.p's and equipment towards planets or starships when the ships transporter is out of action. They come in handy for covert operations too and have excellent space navigation ability. The seven seater shuttles are equipped with limited warp and impulse drive engines, shields, life support systems, a food replicator and emergency provisions for longer stays on planets. Constitution-class ships use matter, anti-matter reaction converters regulated by dilithium crystals housed in Main Engineering's warp drive engines which can propel the USS Enterprise NCC-1701 at faster than light warp speed. 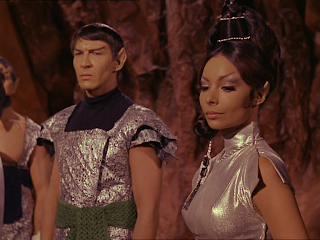 In the episode "Elaan of Troyius", Scotty used the Dolman's necklace which was stung together with dilithium crystals in order to repair the Enterprise's sabotaged, fused dilithium crystal converter. The Dolmans neckless powered the ship's warp engines with enough energy to shoot off a couple of photon torpedoes at the engaging Klingon ship, badly damaging it and causing it to retreat. The flagship USS Enterprise is protected by an impressive grid of deflector shields, structural integrity fields, energy forcefields and emergency blast bulkheads that can repel enemy weapons fire and meteorite showers easily. Starships like Darth Vader's Star Destroyer haven't got an equal chance against the technological might of the Enterprise's phasers and photon torpedoes because Vader's ship, although impressive, only has laser beam technology, cannons and gun turrets capable of making only a few dents in the USS Enterprise's shields. Whose got the most powerful Starship in the Universe? Trekkies do! Thats who! Woo Hoo! But I dare you to prove me wrong! Phasers are more technologically advanced and likely to be hotter that lasers right? Tractor beams are the opposite of deflectors which pull space objects as opposed to pushing physical energy away. They are used to take smaller ships in tow or move space debris out of the Enterprise's flight path. At the stern of the USS Enterprise's are the impulse engines and the nacelle propulsion systems which makes safe interplanetary space flight at sublight and warp speed. One of the technological advances that makes the Constitution class starship possible is the duotronic computer designed by Dr. Richard Daystrom in 2243. In 2268, the Enterprise field tests what Dr. Daystrom hopes will be an even greater invention, the multitronic or M5. Unfortunately Daystrom designed the machine based on his very own memory enigrams which for a moment seemed like one great leap forward for computer science but alas the M5 proved to be more unstable than its creator, Dr. Daystrom who was at a loss to explain its emotional outbursts. Star Trek depicts a future of bright promise. I hope it stays that way. The USS Enterprise NCC-1701 is a vehicle of peaceful exploration and research resorting to strategic counter measures as a last resort. Starfleet Command represents the "logical" evolution of today's military into a servant of man's quest for knowledge, as well as a the need for a strong defense. Hikaru Sulu is a pilot and will figure it out! The USS Enterprise 1701 is finally ready to show us what she can do. Yessss! All helmsman Sulu had to do was flick a few switches and engage the engines. Its the moment that had Trek fans clinging to the edges of their seats preparing for a warp flight right out of the universe, except Mr Sulu, (played by John Cho) goofs up big style by forgetting about the parking brake. Christopher Pike: Maximum warp. Punch it. Christopher Pike: Lieutenant, where is Helmsman McKenna? Hikaru Sulu: He has lungworms, sir. He couldn't report to his post. I'm Hikaru Sulu. Christopher Pike: And you are a pilot, right? Hikaru Sulu: Yes, very much so sir. Christopher Pike: Is the parking brake on? Hikaru Sulu: Uh, no sir. I'll figure it out. Hikaru Sulu: [Embarrassed. Without looking at anyone, he punches in the correct sequence] Ready for warp, sir. Christopher Pike: Let's punch it. 4. Other Cultures & Species Test. In 2364, Relva VII's testing facility is where Wesley Crusher competed to gain admittance to Starfleet but failed the first time. Citizens from outside the United Federation of Planets require a testimonial of good character from one of Starfleet's higher ranking officers before being permitted to take the test. Cadets who excelled in class gained privileges as was the case of the Academy's Red Squad, an elite group, who were entrusted to pilot a starship without supervision. Starfleet has demanding standards and applicants must pay strict attention to its rules and procedures. Successful entrants are expected to excel with their class at a multitude of mental and physical tests or merit the wrath of the Academy Instructor. 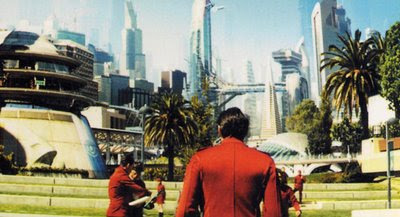 Based on earth, the academy is located at the Presidio of San Francisco. Founded in 2161, Starfleet Academy's specific goal focuses on the quest for knowledge and the preparation of its cadets for galactic unknowns especially in the cadets first year. The freshman year subjects the trainee to athletic disciplines which tests their fitness and reflexes with gym training. Healthcare, universal laws of nature, military defense, conferences, lectures, computer simulations, starship operations all form part of the educational program, Officers learn Federation policy and adhere to strict rules. Starfleets General Orders and Regulations and Starship Operations are mandatory. 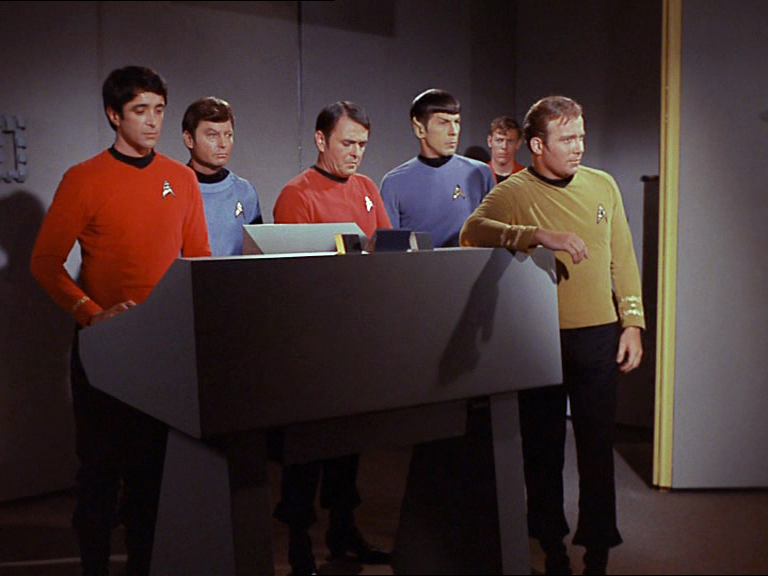 After four years, cadets graduate to the worthy position of Starfleet Officers and are promoted to the rank of Ensign. For the first time in their lives excited cadets face the prospect of a really groovy future serving aboard a starship and are looking forward to serving and defending the Federation with their very lives. Space exploration also presents many opportunities to encounter new alien lifeforms and discover strange new worlds. Starfleet will put its officers on the front lines where scientific research, rendering aid, tensions and starship battles will broaden crewmens appreciation and perception of alien races and species in the universe. Cadets will soon discover Starfleet Academy's curriculum challenging them to their limits with some trainees buckling under pressure in the first year. Starship duty is'nt for everyone. 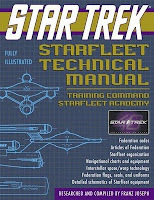 In the following years cadets will choose to concentrate on a particular field of knowledge such as engineering, starship navigation, medical degrees take eight years to complete, piloting, scientific research, stellar cartography, communications, security, with the smartest and uber-intrepid of students setting their sights on a career in Starfleet leading to command of a starship. The Academy's notorious Kobayashi Maru Training Simulator is the next step for these special breed of command cadets. The Computer Simulation will test their nerves for steel and how they react to fear. Senior Officers will scrutinise the cadets response times, disposition and reactions under pressure to get a mindset on the candidates suitability for command. Captain Kirk (TOS) received a commendation for original thinking for being the only Starfleet cadet to have defeated the Kobayashi Maru Test. Lieutenant Savik accused Admiral Kirk (Wrath of Khan) of cheating when he explained his solution for outwitting the Kobayashi simulator by secretly programming the computer. Starship Captains are a gutsy, rare breed of fast thinkers, well motivated and used to encountering aliens lifeforms, Astronomical Objects and are responsible for the lives and safety of the crew. 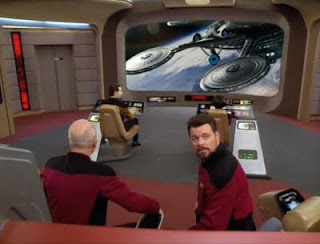 Captains, Helmsman, and Navigators exercise evasive manoeuvres deployed by the ships computer or else Bridge Officers advise the captain to activate the ship's defense systems manually in order to combat stealth attacks on starships. Officers are trained in peaceful negotiations, hand to hand defense lessons, survival training, starship navigation, piloting, weapons deployment and starship operations which is key to reactive defense and securing the starship from an aggressive attack. Starship defenses are usually activated when warring ships are detected sending the crew from yellow alert to red alert. The Federation however, is one big happy family but all is never what it seems in space. Captain Picard is an exceptional leader at finding peaceful solutions for races like the Sheliak Corporate, who were repulsed to find human creatures infesting one of their planets and demanded their immediate removal. Picard's entertaining feats of logic ultimately persuade the Sheliak to cave in to his demands (and made me laugh big style) when he nominates the Grizella who were in a six month hibernation sleep at the time to negotiate as a third party on behalf of the U.S.S. Enterprise 1701-D. Of course, the Sheliak are outraged but Picard severs the communication and gives the unyielding Sheliak time to reconsider. Three weeks to evacuate the human creatures or six months, which do you think they chose? It has been known for Captain James T. Kirk (TOS) to directly order Chekov to blow the U.S.S. 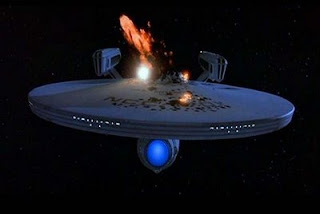 Enterprise's enemy ships into smithereens. The captain's defense strategies for cheating death are legendary throughout the galaxy featuring the destruction of the U.S.S. 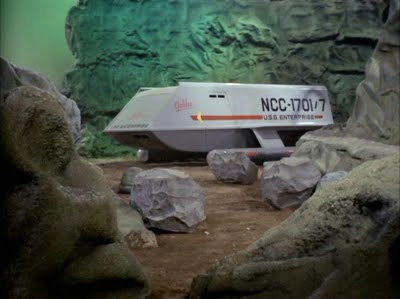 Enterprise 1701 using her auto destruct system to prevent the ship from being captured by Commander Kruge's boarding party. (The Search for Spock.) Starfleet command cadets have a strong desire to win and Kirk never likes to lose. He doesn't believe in the no-win scenario and has on several occasions ordered Mr Spock , Sulu and Mr Scott to warp the U.S.S. Enterprise 1701 out of danger. Its on record Kirk was unsuccessful in maintaining long term relationships with an unspecified amount of women. Due to the perks of command scantily clad women boldly seduced the captain inside and outside of his ships quarters which has forevermore earned him the reputation as a space stud. The United Federation of Planets charts over 8,000 light years of galactic space with a membership of over 150 planets and over 1,000 semi-automated colonies. Starfleet uses military force as a last resort because it belongs to a peaceful Federation of deep space exploration, however it has trained its graduates to defend Citizens of the Federation and render aid under the most severe conditions. The Prime Directive (also known as General Order 1) is a basic component of Federation Policy which forbids Starfleet operatives and starships from interfering with the natural evolution of any society or civilisation. This directive is more important than the protection of spaceships or members of Starfleet. Losses are tolerated as long as they are necessary in order to observe this directive." Despite this, Starfleet Captains are skilled in interstellar Combat strategies and defensive maneuvers should an inevitable conflict with an adversary arise. Its interesting to note Starfleet sanctioned the invasion of the planet Organia in essence breaking its own Prime Directive. Star Trek (TOS and TNG) Blu-ray dvds. Its all happening in 2009 trekkies so grab your communicators and spread the word because heres whats available in current releases and upcoming Star Trek Blu-ray dvd sets. Mogie peeked my interest in Deep Space nine and Voyager which have'nt been released so far. Update: The second release of Star Trek's TOS Blu-ray DVD boxset has those little furry varmints roaming the universe in season 2 saved on disc 4. If you like tribbles, this boxset has it all with the popular TOS "The Trouble with Tribbles," TAS "More Tribbles More Troubles," and DS9's interlaced episode "Trials and Tribble-ations." Stay clued for Paramount/CBS announcements at Comic Con, about Star Trek movie scoops and news releases with new Trek merchandise and Star Trek stars drawing in oceans of eager fans beaming in from accross the universe. Are you eager to discover Star Treks favorite moments and what your superheroes look like on blu-ray HD dvd? If you've got the extra cash, why not go on a trekkie splurge. You know you want to. Anyone can join Amazon.com for notifications about new products which is a handy way to informed and order what you want. Image owner/creator: Paramount Pictures or CBS Studios. StarTrekMovie2009 Blu-ray in a 3 disc boxset. Paramount Pictures 127 mins Rated PG-13 Nov 17th, 2009. Star Trek Blu Ray movie (2009) includes replica ship with 3 disc boxset. Amazon Limited Edition Replica Gift Set. Action / Adventure / Sci-Fi . Star Trek II: The Wrath of Khan (1982) in Blu-ray. Paramount Pictures. 116 mins. Rated PG. Sept 22nd, 2009. Action / Adventure / Sci-Fi / Thriller. Star Trek IV: The Voyage Home (1986) in Blu-ray. Paramount Pictures. 119 mins. Rated PG. Sept 22nd, 2009. Action / Comedy / Sci-Fi. Star Trek VI: The Undiscovered Country (1991) in Blu-ray. Paramount Pictures 113 mins Rated PG. Sept 22nd, 2009. Action / Mystery / Sci-Fi / Thriller. Star Trek VIII: First Contact (1996) in Blu-ray. Paramount Pictures. 111 mins. Rated PG-13. Sept 22nd, 2009. Star Trek: Motion Picture Trilogy Blu-ray. The Wrath of Khan / The Search for Spock / The Voyage Home. Paramount Pictures. Rated PG. May 12th, 2009. Action / Adventure / Mystery / Sci-Fi / Thriller/ 3 disc boxset. The Motion Picture / The Wrath of Khan / The Search for Spock / The Voyage Home / The Final Frontier / The Undiscovered Country. Paramount Pictures. 685 mins Rated PG. May 12th, 2009. Action / Adventure / Comedy / Mystery / Sci-Fi / Thriller/ 7 disc boxset. Star Trek: The Original Series - Season 1 (1966) in Blu-ray. Adventure/ Sci Fi/ Television/ 7 disc boxset. Star Trek: The Original Series - Season 2 (1967) in Blu-ray. Paramount Pictures. 1310 mins Not rated. Sep 22, 2009. Adventure / Sci-Fi / Television/ 7 disc boxset. Star Trek: The Original Series -Season 3 (1969) in Blu-ray. Adventure / Sci-Fi / Television/ 6 disc boxset. Star Trek: The Next Generation Movie Collection in Blu-ray. Paramount Pictures. 448 mins. Rated PG-13. Sept 22nd, 2009. Action / Adventure / Sci-Fi / Thriller. 5 disc set. Paramount Pictures. 111 mins. Rated PG-13. Sep 22, 2009. Heres a list Empire critics have composed of the 500 Greatest movies of all time. Star Wars is listed five times in Empires Movie Hall of Fame with Star Wars Episode V: The Empire Strikes Back placed at no 3. Is'nt it curious that Star Trek is completely absent from this list? Our fast paced new Star Trek XI movie has introduced a new breed of trekkie fans to the franchise (dare I even call them that!) 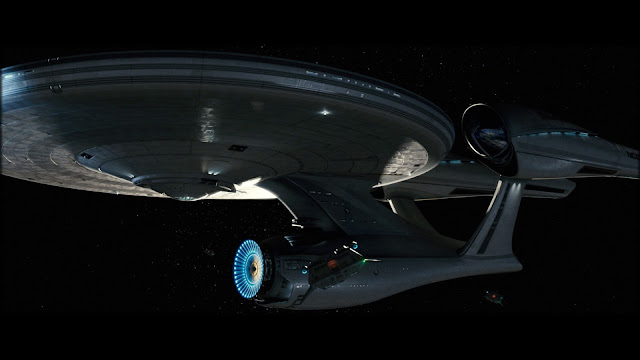 spurred on by the sleek, daring crew of the USS Enterprise 1701 directed by Emmy and Golden Globe-winner JJ Abrams. Empires 500 movies are an illuminating collection of reviews amassed over time from polls to dedicated fans but were the voters under the influence of Star Wars? I'm serious, Vader's power of the darkside is obviously weaving its dark spells on planet earth or else this skullduggery is a reflection of the times were in with darkside mortals outnumbering trekkie lifeforms in the galaxy. 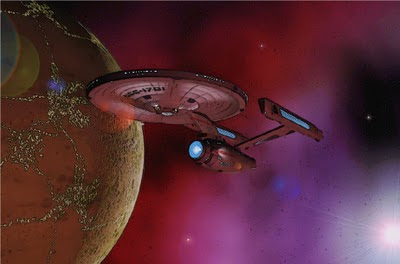 So I'm calling all trek fans to join Empire and submit "Star Trek, The Wrath of Khan" as a NO 1 all time great. Its crunch time trekkie fans to strike back at the force! Here's a fun youtube clip from the DMPhoenix you'll enjoy. Its awesome. Vader's darkside forces are mobilized for war against Captain Picard's flagship Enterprise! Yessss! how my heart bleeds for them! Who am I rooting for? Why the Enterprise of course. 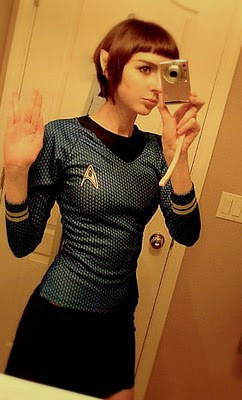 I'm a fully fledged trekkie and you better believe it. I was itching with excitement to see Picard's Federation flagship swoop in for the kill and obliterate Vader's force completely. Does it happen? Quantum torpedoes vs. lasers, watch and see who wins. Now you know how Captain Picard felt, snatched from his beloved USS Enterprise NCC 1701-D and dragged aboard that Borg cube, against his willpower by all those heartless drones. "I will resist you with every strength in my body." Smitten by the spacebug, I set my secret trekkie plan in motion. This was just the beginning of something new. It took a while saving up but within time, I had my own TV and was recording Star Trek TOS every week. How I treasured those classic re-runs. Worf "They're now locking lasers on us!" On hearing this news Data has a major fit of infectious laughter. I love the enlightening philosophical nature of trek, its really deep. So I suspect the same is true of new trek fans who having seen Star Trek XI are by now infected with the spacebug and in severe need of more trekkie fixes. Where else can we turn to except 726 episodes of five action series and one animated series. Damn those space bugs! Every single Star Trek movie including The Wrath of Khan has failed to meet the grade wth Empire isolating Star Trek to the outermost corners of the galaxy. Shame on those darkside ptaqs! They thought they could outwit us with their statistics. Star Trek Tradition, Logic and the Needs of the Many. Star Trek XI is now the second highest earner of Star Treks franchise with takings of $222.7 million in 31 days. This movie warped past the Wrath of Khan and has set its trajectory to overtake the reigning Star Trek epic of the universe held by Star Trek The Motion Picture. Star Trek I bagged $139,000,000 for Paramount which is a cool measure of success and a ton of money for 1979. You can bet your Trekkie dvds it won't take seven years for the next Star Trek movie to hit the big screens. Logic dictates the needs of the many outweighs the needs of the few or the one. Does it matter Star Trek XI messed with the Final Frontier? Yesss! and what a reaction its getting from the fans. 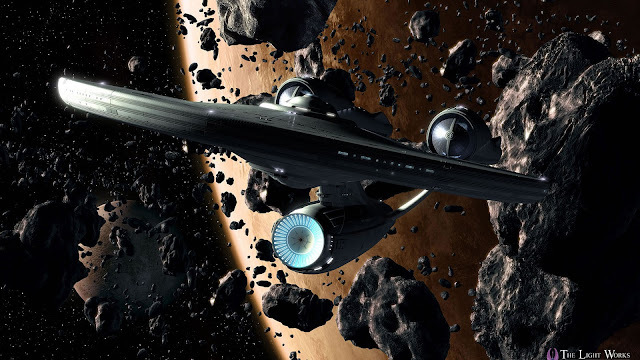 Sure, Star Trek's space time continuum has been altered but judging from the figures, previews and reports from accross the internet, Star Trek XI is successfully reaching out to people boldly going where Trek hasn't been in years. (Blashememy!!! I can hear horrified Trekkies gasping.) "Your'e crossing over to the dark side aren't you!!" but nooooo, I'd never do that! I'm just trying to be logical about this and remember its Spock Prime's fault we're in this fine mess int the first place. Just kidding, I'm skylarking now. Star Trek has a lot of canon, rules and regulations known as "Trek" which can influence the eventual outcome of life and death in its timeline. For example, the Pon Far involves the Vucan Mating ceremony whereby Mr Spock is compelled to return home every seven years to purge his emotions. The poor vulchie will die unless he mates with a Vulcan chick or fights to the death with a suitor of T'pring's choice. In any case, it really doesn't matter because Vulcans are born with superior strength and whoever is selected by T'Pring, is gonna get the spuds whacked out of him. Unfortunately she chose Captain Kirk of the starship Enterprise to fight Spock and Mr spock HAD to engage him! "This is a fight to the death". warned T'Pau. "Do not interfere!!" 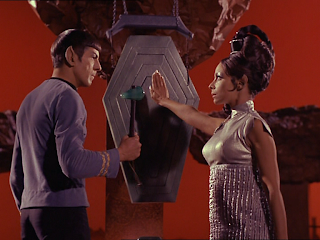 The Vulcan Ponn Farr ritual eliminates the deadly imbalance of toxins poisoning Spock's body only after the Vulcan has gone through hell (Burning of the blood) and ranting and raving like a complete lunatic but this is all perfectly normal for vulchies. In the end Spock is returned to his good old emotionless, logical self after his mating urges are quenched with the knowledge that his good friend and captain has been strangled to death by his very own hands. Ever since Star Trek Nemises flopped at the box office in 2002 with only $43,254,409 to show for at home in the US, Star Trek has been in need of an additional generation of fans willing to give themselves over to an inspiring, action adventure with gratifying computer graphics, sound effects, lighting and movie sets essential to producing a rip-roaring action movie prequel with a stimulating and entertaining trek timeline. That time has arrived, Star Trek is back! "Doctor, I shall be resigning my commission, of course..."
"...so, I would appreciate your making the final arrangements." "Doctor, please, let me finish. There can be no excuse for the crime of which I'm guilty - I intend to offer no defense. Furthermore, I shall order Mr. Scott to take immediate command of this vessel." "Don't you think you better check with me first?" - Spock, McCoy, and, much to Spock's surprise, Kirk.